Since I wrote my original article on Painting Plastic Structures I've learned a few lessons. I've also been very pleased with the longevity of the model structures that I took the the time to do right. That article is daunting to some folks though, so I've also take to writing articles about individual "entry-level" structures, including the Piko Gingerbread house and the CMS tower. The original is patterned after the dispatch or telegraph offices that used to grace rail yards in the golden age of steam. 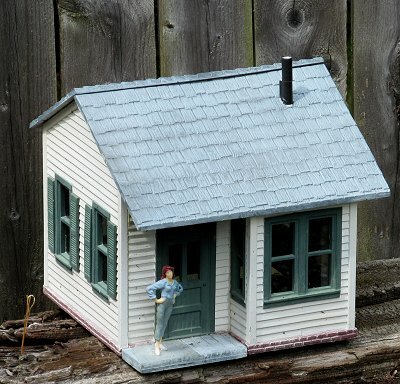 But it could be a small house, or a small store or a real estate or used car lot office. Note About the Level of Detail - Please don't be put off by all the little steps in our kit-painting/assembling articles. Most kit instructions assume an experienced user, so they leave out minor, but important steps that experienced kit-builders do without even thinking about them. 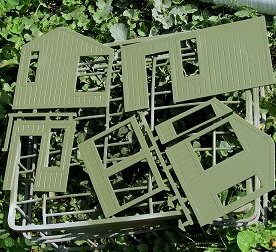 We just want to make sure you have a painless experience, especially if this is the first building kit you've ever painted and assembled. We also want you to be very satisfied with the finished result. If we leave out a bunch of steps to make you think that kitbuilding is a breeze, you will not be as satisfied as you could be. Once you've done a couple kits according to our instructions and seen the results, you'll be doing all of those minor, but important steps automatically, too, whether you have access to specific instructions or not. Note About Goofs and Glitches - It seems like every project I do either has something that didn't turn out the way I expected it to or something I wound up rethinking and doing a different way. This project had both. But truth be told, this sort of thing happens to everybody - the "experts" just don't tell you about their goofs and glitches. No, you won't run into the same goofs and glitches that I do. But I hope that by being a little more honest than the average "how-to" writer I can encourage you to keep going if you hit a snag or something goes "sideways" on you. It happens to all of us, really. 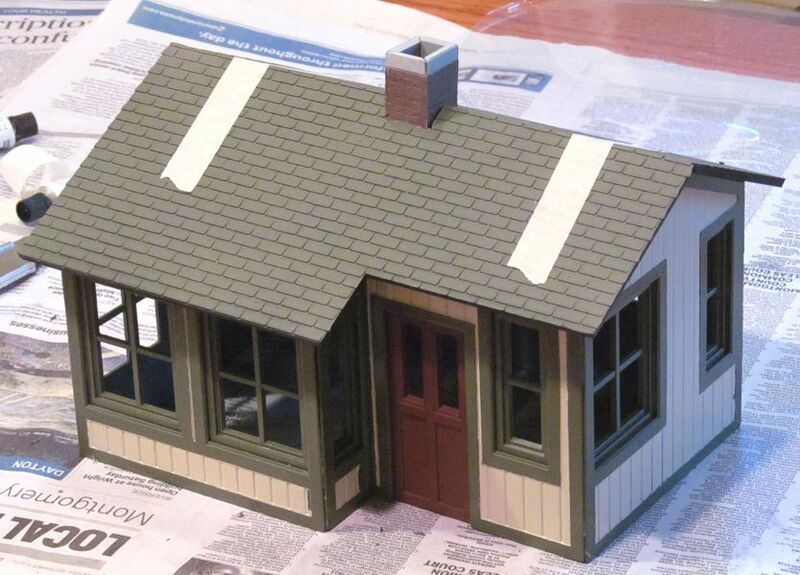 Flat or satin spray paint to make the colors of the building and roof. Try not to use gloss unless you want your building to look plastic. A hack saw or razor saw for cutting the pieces off of the sprues (those little "trees" that the parts are stuck to when they come in the box). A knife you can use to cut off the flash (extra bits that stick out at the edge of the piece where the molds met). A flat file you can use to smooth off any rough places from removing the sprue or flash. Some place you can spray paint without asphyxiating yourself or accidentally spraying your spouse's car. On calm, warm days, I set my projects on antique milk cartons outside. 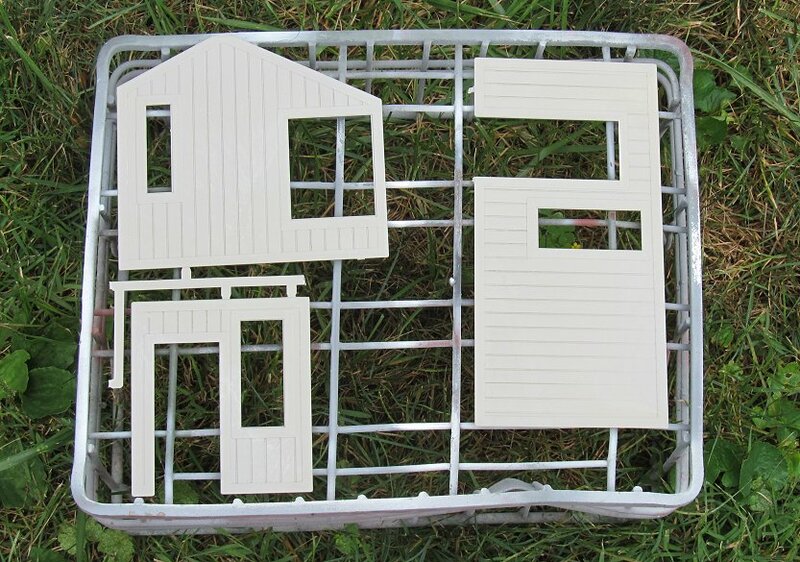 On cool or windy days, I may use an appliance box with the top and one side cut out in the garage. Super-cheap little paint brushes, the kind you buy in bulk for elementary school projects. 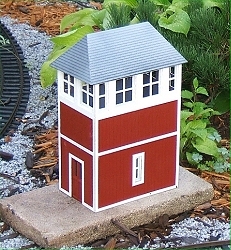 Our Buildings for Garden Railroads buyer's guide on our Garden-Train-Store.com site lists most Colorado Model Structures kits, along with similar kits from other manufacturers. At this time, CMS kits are only available direct from the manufacturer. 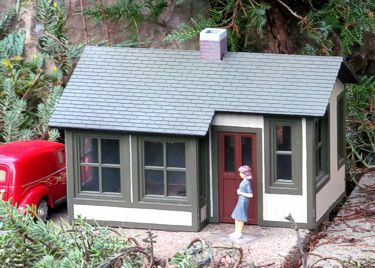 The Buildings for Garden Railroads page has links to the pages you need to see and order these kits. If you're used to bulky 4-colored cardboard boxes that look good on hobby shop shelves, you may be surprised when your kit arrives in a big, relatively flat cardboard envelope. 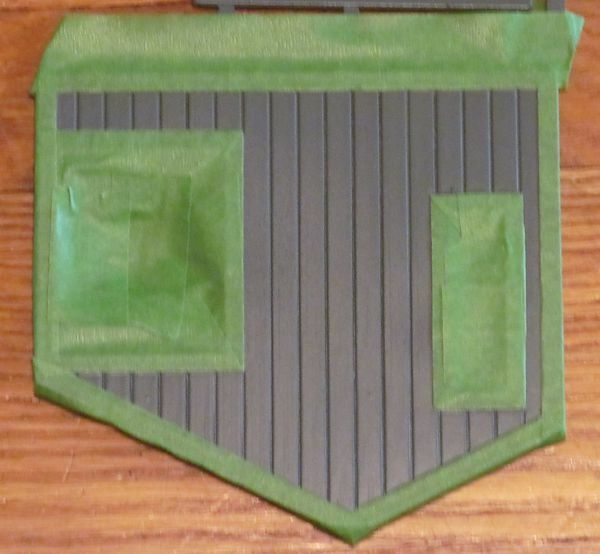 You get an instruction sheet, and several pieces of gray and brown plastic. 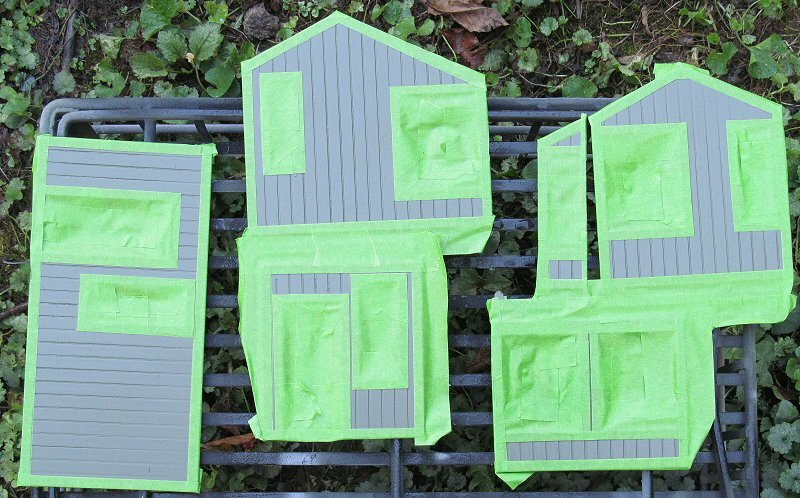 The detail is molded into the pieces, but it's not very deep, so your building will look lots better if you paint it in a way to make the detail stand out. Every plastic model has places where the bit you need was attached to little "trees" or "pipes" that you don't need. 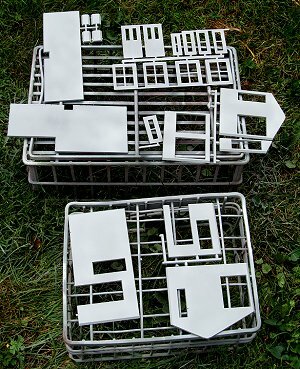 These are called the "sprues." They're there because the mold has channels where the plastic is forced through the mold. In some cases, small parts are still stuck to the sprues when you get the model. 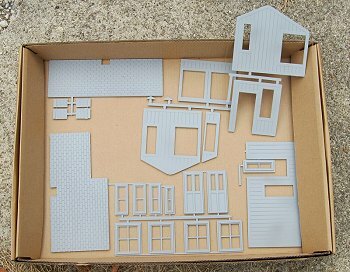 In other cases, the sprues have been cut off, but a rough place remains that you will need to trim and or file. 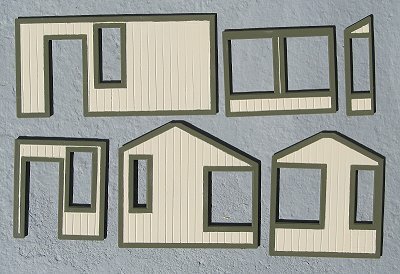 The Colorado Model Structures Cascade Summit Dispatch Office that I received has the doors and most of the windows on a single sprue. 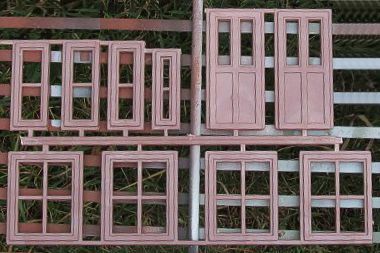 Note I much prefer to have parts like windows and doors on separate sprues - it makes them easier to paint a contrasting color than if they're molded right into the walls. However, some CMS users who are used to masking everything anyway have asked the owner to mold the windows into the walls. If you get a CMS kit that has the windows molded into the walls, you can usually treat them as "trim" and get good results that way. 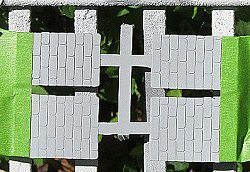 A couple of the walls may be attached to the sprues as well - I usually leave those attached while I prime and paint, since it makes it easier to handle pieces without contaminating the surfaces once they're cleaned up. 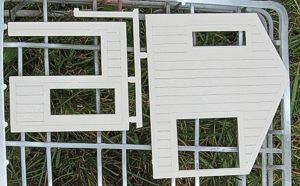 However, if a sprue attaches where it will be inconvenient to remove it after painting, I may remove it before priming. On the Dispatch Office, there is a sprue bit that needs to be cut off before painting. It runs across the "open space" where the chimney will go. Yes, that seems weird to have it there, but the physics of injection molding required it for this piece. After determining that it had to go, I hacksawed the sprue out and filed the rough edge smooth. 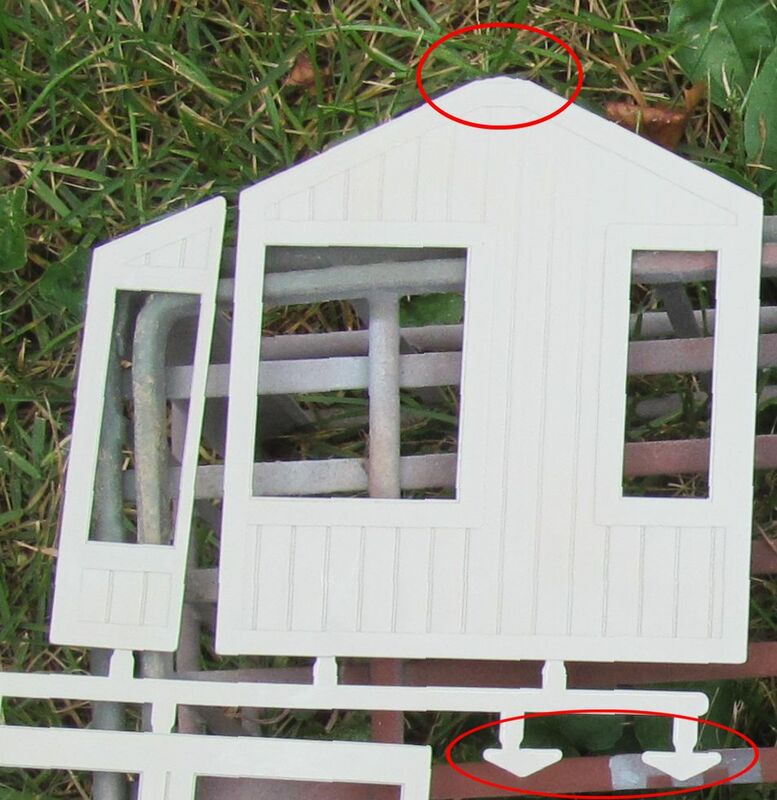 By the way, the chimney pieces are attached by a sprue to one of the roof pieces. 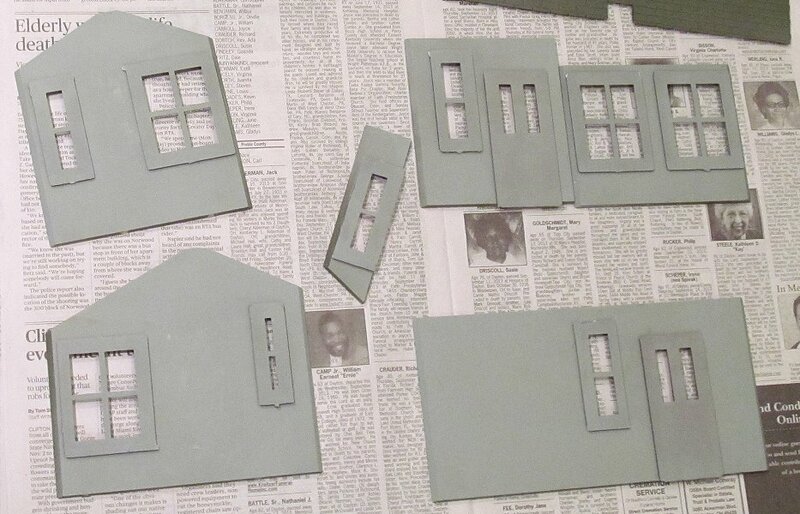 I left them on the sprue until I primed, then cut the sprue to separate them from the roof piece. 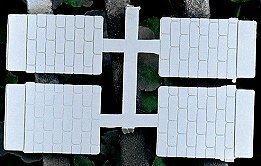 One unusual aspect of this kit is that, due to a mold size limitation, the gables of the end walls don't go all the way to a point; a separate triangular piece is glued over the tip of the gable once the building is assembled. 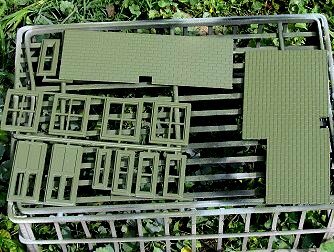 For me those tips would be the same color as the trim color, so I left the tips on the sprue until after I had painted everything the trim color. 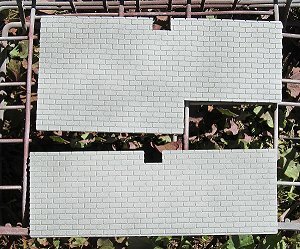 Some CMS models have places where a tiny bit of the shingle or brick pattern "leaks" out past what should be the edge of the piece. Most models by most companies have places where a little bit of plastic extends out from the mold line. This is called "flash," and should be trimmed before you clean, prime, and paint. 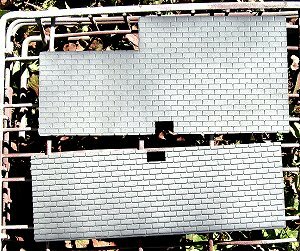 The photo to the right shows the flash from the shingle pattern on the roof, as well as the stub from a sprue that has already been removed. I used a knife to carve off the flash and my flat file to smooth off the stub from the sprue. 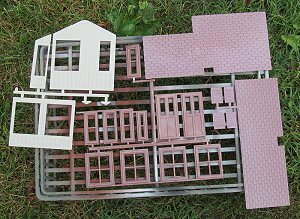 I could have removed the chimney sprue from the roof sprue at this time, but decided to wait until after priming. It's possible to spray paint stuff on newspaper in the driveway, if you have no wind to speak of (in Ohio, I mostly wait between gusts of wind, since it's almost never entirely calm). In cold or inclement weather, you can cut the top and one side off an appliance box to create a temporary "paint booth," but you need to set the thing where there's lots of ventilation, no open frames, and nothing nearby that could be damaged by overspray. I've also discovered that spray paint covers better when the object is NOT laying flat on another surface. 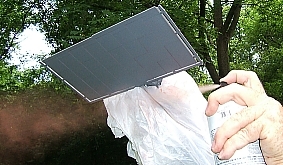 The vaporized paint can work its way "around" the object better when it doesn't have to work against a cushion of static air near the surface of the cardboard or newspaper. That's why I use the old milk cartons you see in so many of my photos. You could stretch hardware cloth across a wooden frame and get the same result. Primer is a flat neutral color that is theoretically formulated to stick to the surface better than colored paints. Its flat finish helps most "top-coat" colored paints to stick better than if you tried to use them directly. By the way, there are several brands of paint that now advertise they are formulated to work directly on plastic. My sense is that they may stick well to the plastic, but they won't provide the extra UV protection that a good coat of primer does. I use Walmart's Gray Primer, usually available for $1.30 or so a can. You can use more expensive primer if you want, but this does the job for me. 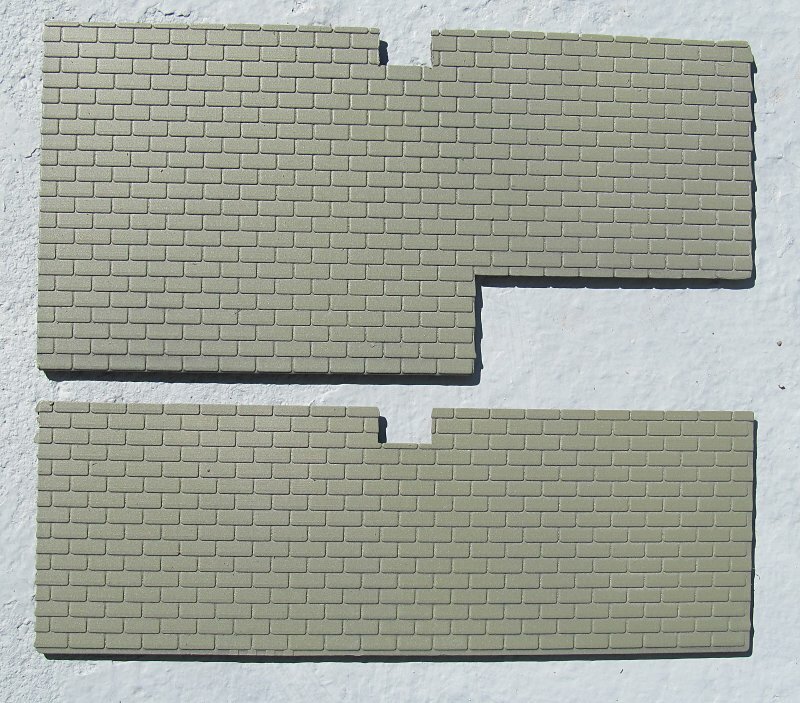 If the final building is going to be "brick-colored," I may use a "rust primer" instead. 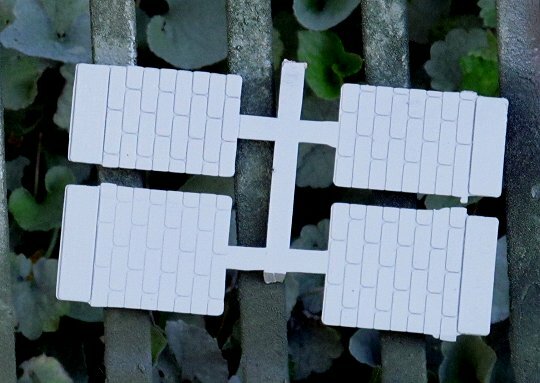 Don't bother with "white primer," even for pieces that you are going to finish in white. It makes no difference in how many topcoats you need, provides much less UV protection, and leaves the buildings translucent instead of opaque - a problem when you add internal lighting. "Preps" the piece for the decorative layers of paint. Adds an extra layer or two of UV protection. Yes, your top coat may be opaque and outdoor-rated, but having a coat or two of primer underneath it lengthens the life of the top coat as well as the plastic - it stops that last little bit of UV getting in and working damage from the inside out. 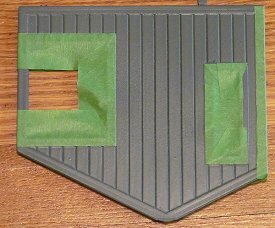 Removes the "plastic" look and feel and helps me start visualizing the piece as a building component instead of a hunk of plastic. Helps keep your building's walls from glowing when you add internal lighting. 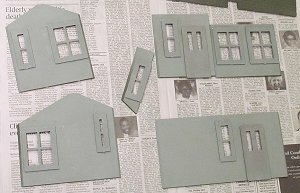 For me, priming also turns the building into a sort of "blank canvas," so I can plan my project's final look without being distracted by whatever color the manufacturer chose. Removes fingerprints that could keep your paint from adhering properly to the plastic. Once you have cleaned the plastic, treat it as you would a photograph (remember those? ), handling it only with clean hands, and only by the edge. 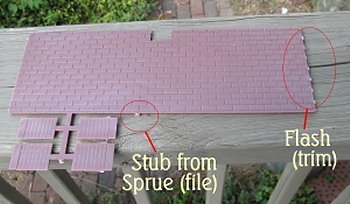 If you have pieces that are still on a sprue tree, handle them only by the sprue. The photos below show the kit pieces set out and ready to prime. Since they're all going to start out with gray primer, it's more efficient to prime them all at once. 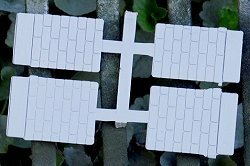 By the way, after I took this photo, I turned the pieces over, because I wanted to prime the back (or inside) of each piece first. By the way, priming is something that takes a bit of time to do right, but most of the work is "hurry up and wait." So if you can prime several pieces at the same time, that's not a bad thing. 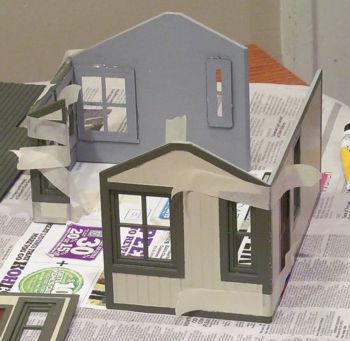 I would encourage you to keep "extra" gray primer on hand. There's no precise measurement, but I would say I tend to get about one building per new can of primer. You might get less, especially when you're starting out, so save yourself a trip to the store and pick up more cans than you expect to need while you're there. Most spray paints work best over 60 degrees Farenheit. Start with the "back" side of each piece. Believe it or not, sealing the plastic on both sides will help longevity, plus it will help keep your walls and roof from glowing when you add lighting. 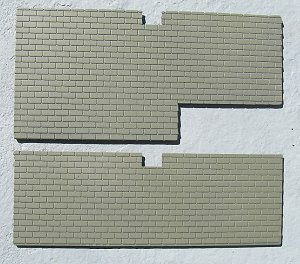 If possible, arrange your pieces at a slight slope, especially large flat pieces (most spray cans can't spray well straight down). Shake the primer can until you can hear the little ball rolling freely. Do NOT aim the can at your piece until after you've pressed the button. Instead hold the can off to one side about 8" away from your piece. Press the button and bring the spray pattern all the way across the piece and off the other side before you release the button. Otherwise, you'll wind up with a circle of extra paint where you started or stopped spraying. The whole process should last two or three seconds. By the time you've bent over to take a look at the surface of your piece, the paint should already be drying or dry. If there are any drips or even any shiny spots, you moved too slowly. You don't need perfect coverage of the back, but it helps if you get the inside of the windowframes from a couple angles - as long as you don't saturate or cause drips or runs. The photo to the right shows the back/inside surfaces of the building primed. Like almost all of the photos on this page, you can click on it to see a bigger photo. 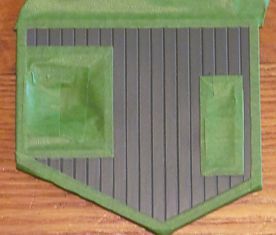 Once you feel like your coverage is "pretty good," let the back dry for an hour or so, then turn the piece over and start on the front, using the same technique to avoid oversaturating or creating drips or runs. You may not have 100% coverage from your first coat of primer. Don't try to "fix that" by saturating the paint on the piece. 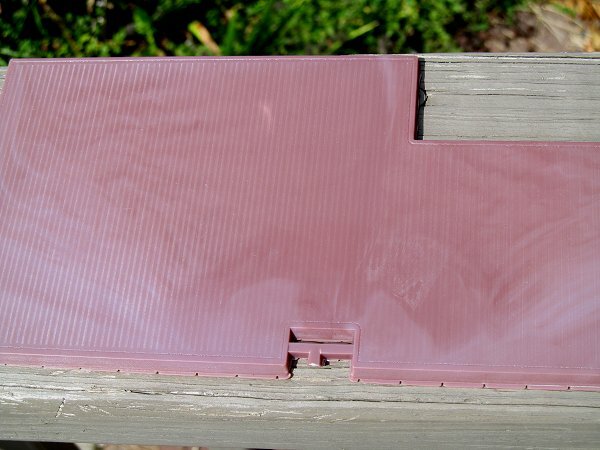 Even if you don't get any drips or runs, you'll create areas with uneven coverage, and possibly fill the lines between the "boards" of your "siding" or hide shingle detail. In twenty or thirty more minutes, come back and look closely at the piece to see if you need to hit it from another angle. If so, hit it again. 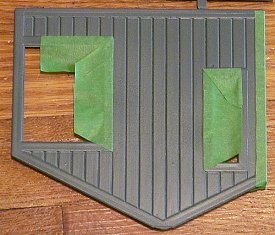 The detail on these pieces is not molded very deeply, but it's still possible to get just, say, the top and left edge of each windowframe and not hit the bottom and right edge until you come at it from another angle. Again, take "baby steps" so you don't accidentally leave so much paint that you hide the details. At the end of this process, let the pieces dry overnight. If you worked outside, and you need to bring them in, lay them out somewhere that wet paint won't damage, and be certain the "face" of the piece is completely exposed. 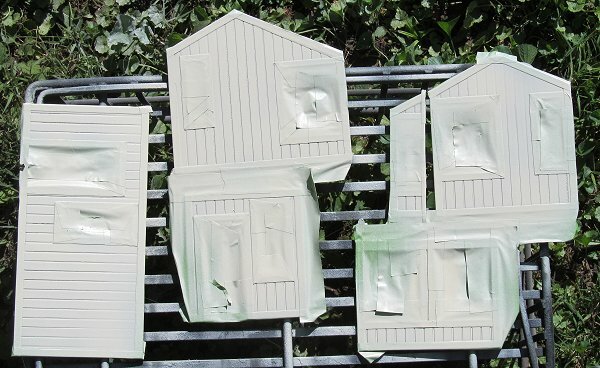 In my case, it started threatening rain soon after I had finished priming, so I carefully laid the pieces in a big box lid to bring them into the garage to dry. This is a good time to remove the chimney pieces from the sprue, since you're not going to paint it the same color as the walls or trim. I should have removed the doors as well, since I decided to paint them a different color later. 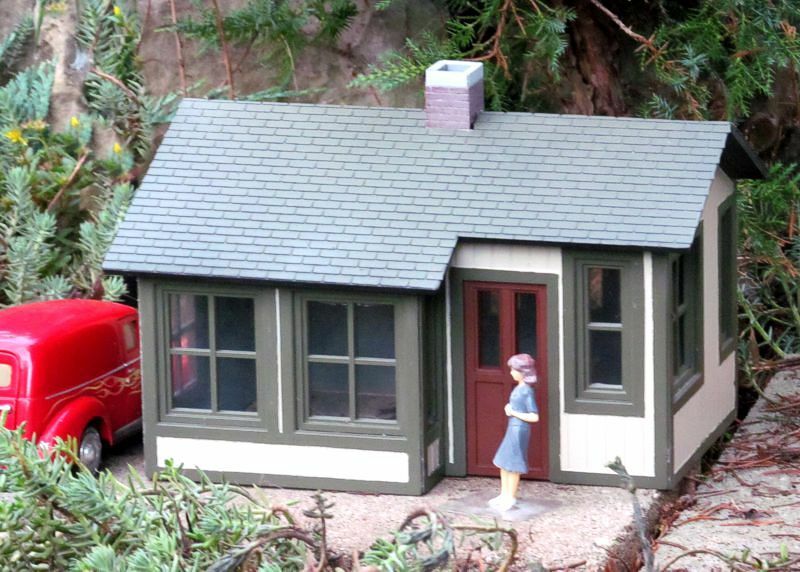 If I was painting this to be a "dispatch office," I would have used the "rust-red with white trim" scheme that I used on my New Boston station and switch tower. But I decided I wanted to make it a house. So far I have two houses on my railroad that are white with green trim (the standard paint color for frame farmhouses in the midwest a century ago) and one that is blue with white trim. 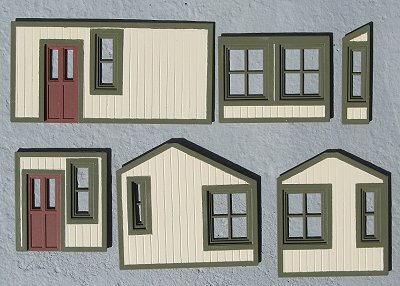 Almost all frame houses in the midwest between 1880 and 1960 had white either as a base color or as a trim color, but I couldn't come up with any combinations I really wanted to paint this building. Then it occurred to me that it might be fun to paint it the "Williamsburg" colors that Shelia and I painted our first house. Actually Sherwin Williams discontinued the colors we used decades ago. But I had a can each of Dark Olive that wasn't far from the "Governer's Palace Tan" we had used for trim, and an Almond color that was pretty close to the "Bracken House Biscuit" color we had used for the base coat. 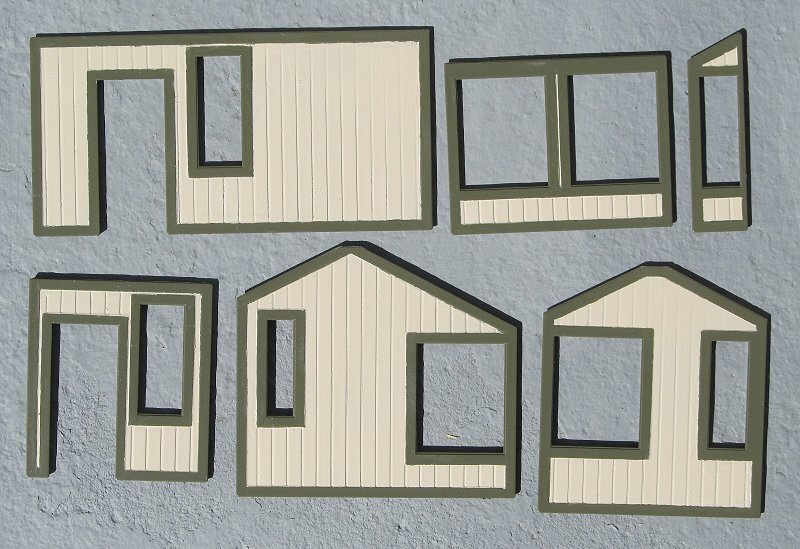 The way these are built, you could easily paint the windows and doors a different color, also. To be authentic for our first house the windowframes needed to be the same color as the trim, so I figured I'd start with that and decide whether they blended in too much. 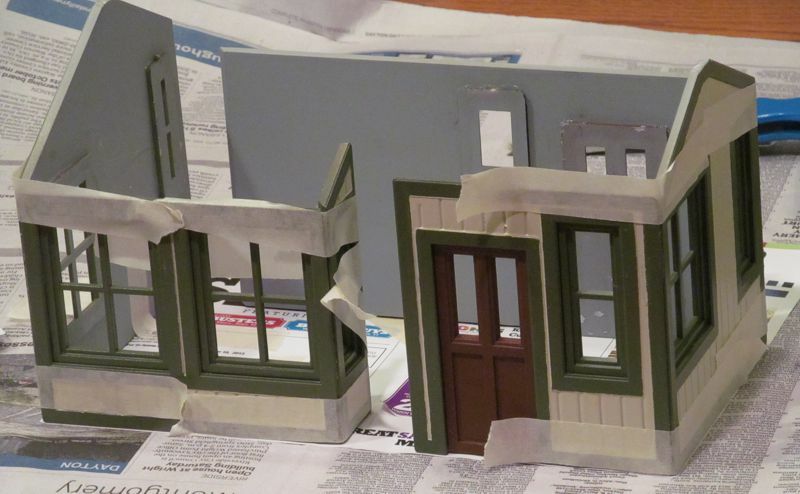 Although I often paint the doors a contrasting color, I thought I'd try with them the trim color first. The chimney should almost always be a different color, though. 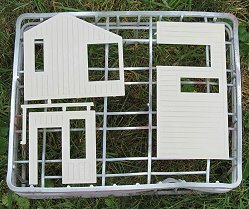 After priming, I cut the sprue that held the chimney pieces away from the roof piece it was attached to and filed the roof piece carefully where the sprue had been attached. 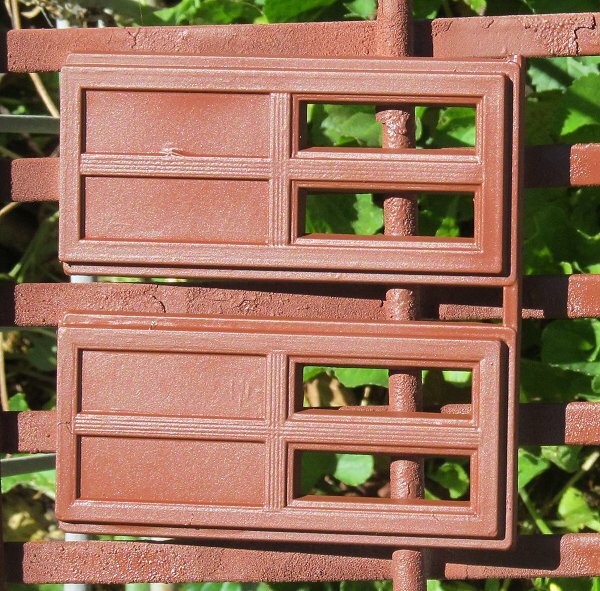 If you want the doors to be a different color, cut them off of the sprue before next step as well. Or you could do what I did, paint them the trim color, then decide you want them another color. Ooops. 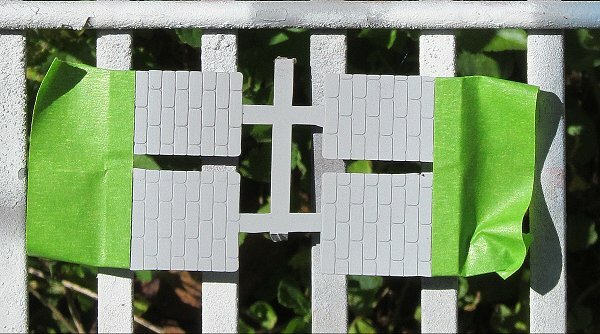 In my case, since most of the pieces were going to start out in Dark Olive "trim" color, I decided to paint those pieces that color first, then mask where necessary before painting the Almond "base coat." When I was sure the primer was completely dry (overnight again), I laid the pieces out and sprayed them lightly with the Dark Olive. After that coat had dried for a few seconds, I moved to another angle and sprayed them again. I did this two more times, so that I could be sure I had hit every inside edge of every windowframe and doorframe, without depositing so much paint that it obscured the detail. Then I let it dry in the sunlight for several hours, and hit it one more time to be sure. After that coat had started to dry, I brought the pieces back inside. With almost the whole building painted Dark Olive, it looked a little like a pile of "army men." The military look was not what I was going for. Hopefully once I'd tweaked the roof color and painted the base color on the walls, the thing would look more like a residence and less like a military office. This building requires relatively little masking, compared to many others. But masking the trim before you add the base coat will make the trim really stand out. For this stage you need a roll of masking tape. You also need a pair of scissors and a comfortable place to sit with good lighting. Your piece should have dried overnight, at least - the last thing you want to do is pull the paint back off when you remove the masking tape later. Note: For this project I promised a friend I'd try FrogTape, which is supposed to help you get really good edges. It also is notorious for pulling off the paint that you masked over when you remove it. So if you are going to use FrogTape, be certain that the paint where the tape will be going is "stuck good" and very dry. 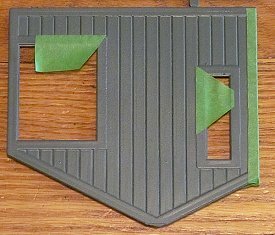 In this case, I had several "irons in the fire," so the Dark Olive paint had a chance to dry for about a week before I taped over it. On this building, the windowframes are large and relatively easy to mask. However, I want to get as fine a line as possible, so I took some care, and I want to demonstrate a technique that works on even the most difficult windowframes. 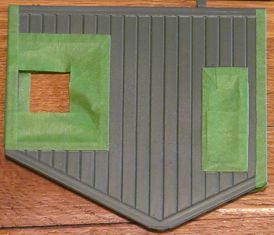 Cut a piece of tape with an oblong corner that you can align along the first edge of the windowframe. 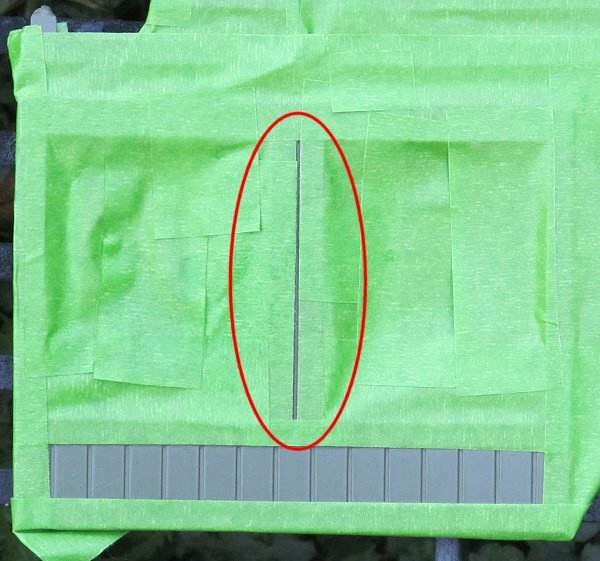 The pointy corner of the tape goes with the tip at a corner of the window, and the long straight edge of the tape goes over a straight edge of the windowframe. 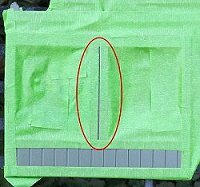 Cut another piece of tape with an oblong corner and put the pointy tip into the same corner you have already half covered. 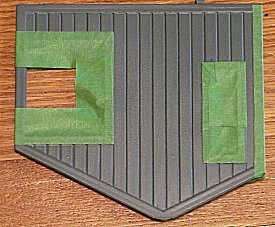 Now the whole corner is masked with more precision than if you'd tried to cut an exact 90-degree angle and get it exactly into place. Repeat the process for the other corners. 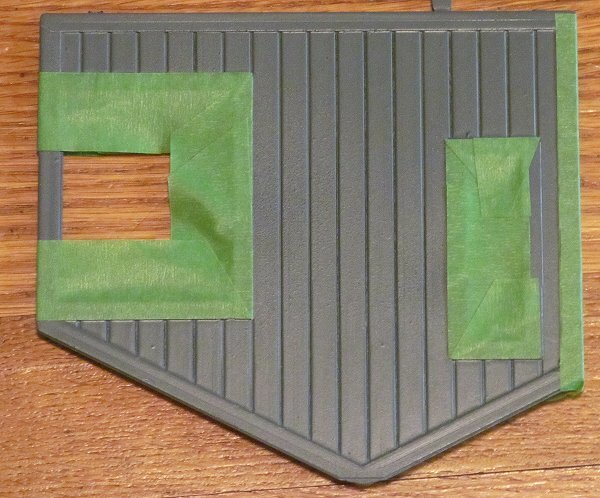 Use random lengths of tape to cover any "in between" trim bits you didn't cover. I like to fill in the rest of the window as well to keep the base color for going through to the "inside" of the building . .
Several of the pieces will have very small lines of "base coat" between bits of trim. In the example to the right, there's a bit of "wall" between the big windowframes on the building's front. Attention to this sort of detail helps the building to be more convincing in the long run, so I masked very carefully around them. The photo to the left shows the walls ready for painting. Because I handled the walls so much in between coats, I dampened a soft, lint-free cotton dishtowel with Fantastic and wiped the surfaces. Then I dried them with the dry end of the same towel and let them dry in the sun for a couple of hours to be sure they were dry. Based on what happened later, I probaby should have hit them with a light coat of primer before I went to the next step - as it turned out (spoiler alert!) the Dark Olive "satin" paint didn't take the next coat as well as I expected it to. Unless you have a really complicated color scheme in mind, the next color you paint will usually be the last for this building. I would recommend lightly dampening a lint-free cotton cloth with Glass Plus or Fantastic or similar cleaning solution, then wiping off the areas that you will be painting, in case you've left fingerprints. Then let it dry thoroughly. 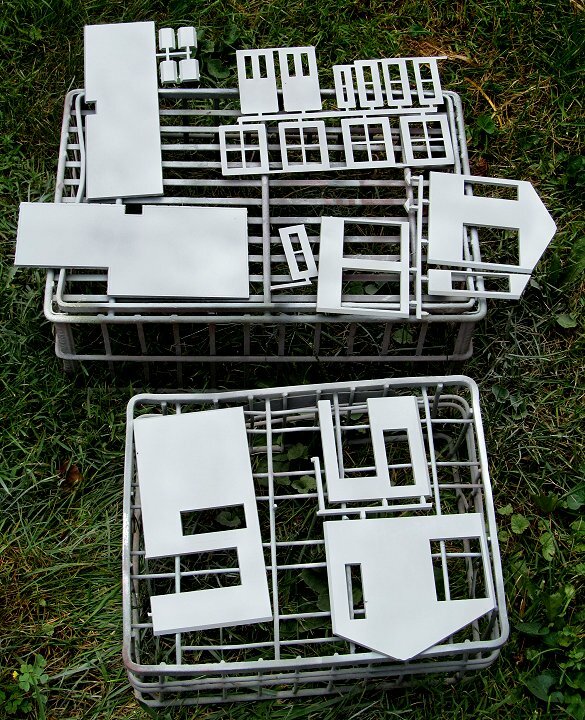 The spraypainting process is exactly the same as the priming process was - multiple light coats from different angles. Do not try to get the whole thing covered the first time - you'll create runs, drips, splotches, and missed edges. 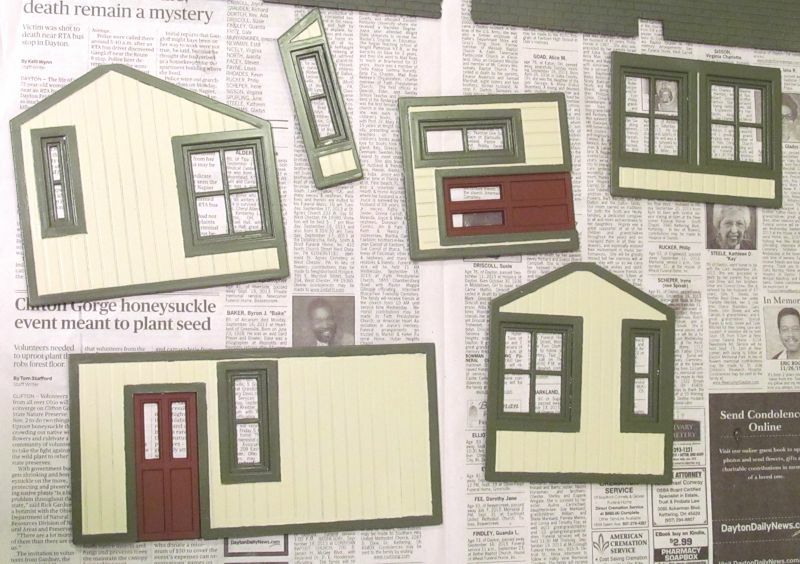 Once the top coat seems dry, you may be tempted to rip the masking tape off and see the final result. Don't. The paint needs to be completely dry, including any tiny "pools" of paint that take extra time to dry. Otherwise, any undried paint will get where you don't want it. In my clinics I call this the "magic trick." When the group is small enough, I pass around the masked-and-topcoated piece and let each person tear off a little bit of tape. By the time it's done, I have a two-color building front that looks almost as good as any model you can buy. I say almost, because there is inevitably some little place where the last color leaked through or under the tape, or where the last color didn't cover, or - very rarely - where the masking tape took off the under coat. The "Touch Up" section below addresses those problems. Back to the Frog Tape that I had promised a friend to try. 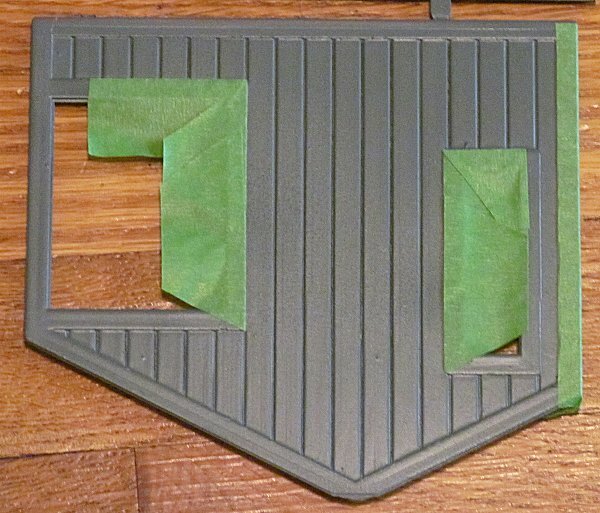 One provision I made was making certain that the trim color was really, really dry before I began masking. What I didn't take into account, or even think about, was that I seldom paint over one satin color with another. As it turned out, the Almond paint didn't stick to the Dark Olive as well as I expected. So when I took the masking tape off, I had to be careful to keep the top coat from coming off with the tape. In the photo, you can see several places where the Almond color came off when I removed the tape - if I hadn't been very careful once I saw this happening, it would have been worse. Ironically - this is not a masking tape failure, it's a paint failure. So I can't really say the FrogTape had a fair test. At this point you need to remove the sprues from the walls at least. Try to get a smooth separation, say, with a knife or razor saw. If there is any roughness where the sprue was, apply the flat file. Don't forget to save the little tips that will go on top of the gables. A decade ago, I bought one of those kids' paintbrush packages where I got 30 brushes for a dollar or two. I'm still using those instead of expensive brushes, because brush-painting with spray paint does a number on brushes. You are going to be using a super-cheapy brush to apply "spray paint" manually, then throwing it away, since it's not worth the cost of paint thinner to clean the brush. Determine which color or colors you need to touch up. 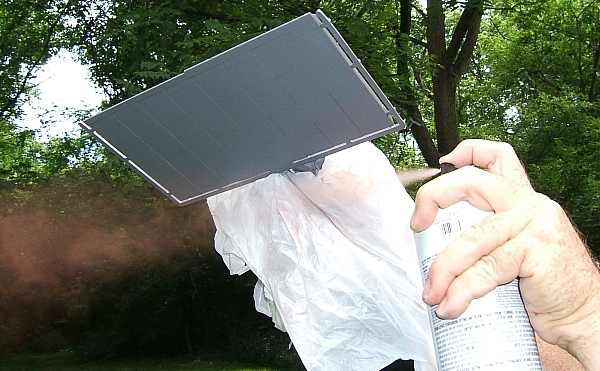 Take those spray cans outside or to a very-well-ventilated spray-paint safe location. Wear old clothes or roll up your sleeves. When you're ready to start, take the cap off of the first color you want to use, hold it upside down at arm's length, and spray some of the color right into the cap. Overspray will go everywhere when you do this, which is why want to do it at arm's length in a safe, well-ventilated location. You'll notice that the paint you sprayed into the cap stays liquid for a few seconds. Set the can down, dip the cheap brush into the paint, and touch up any areas that need this color. You may have to repeat the "spraying into the cap" move more than once if there is a lot of touchup to do. Light colors (like white) may need to be hit two or three times. This is one case where you don't necessarily have to wait until the area you're painting is completely dry before you hit it again - if you wait too long, your brush will dry out and you'll have to start another one. The photo to the right shows the walls after they've been touched up. The touched-up areas may not blend pefectly, but that's okay, as long as the "goof" isn't obvious from more than a few inches away. When you're done, be sure to handle the building fronts carefully (usually by the edges) because spray paint applied this way may take hours to dry completely. Dispose of the brushes, and put everything away. 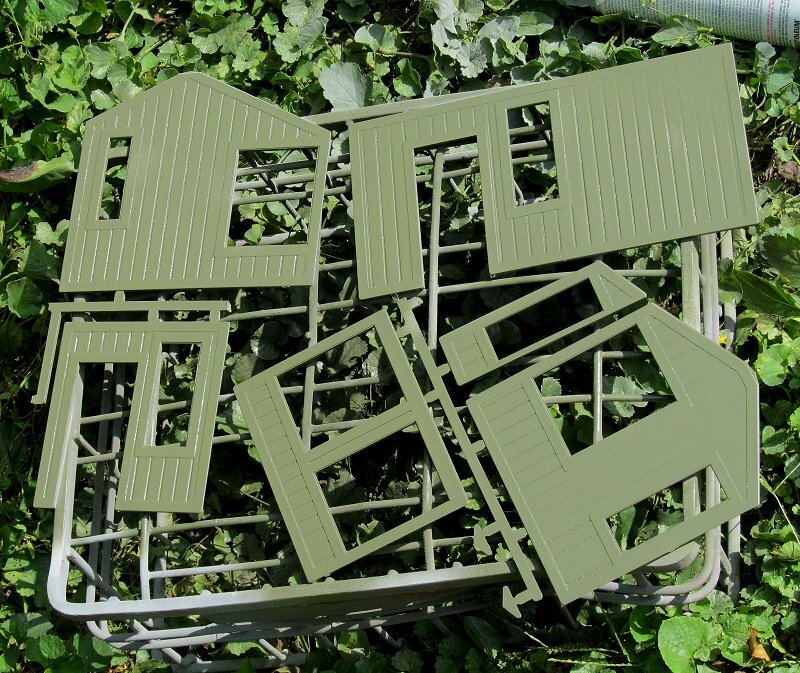 When you remove the doors from the sprue, the bottom edge of the door may be a little rough. Use the flat file on it before you paint on the final coat. If you've already painted the "final coat," follow the "touch up" instructions above to touch up the doors before you glue them in place. You may like your doors to be the same color as the walls or as the trim, but they'll stand out more if you choose a contrasting color. Once I had painted the doors on this structure the same color as the trim, I remembered that the doors on the real house I was paying tribute to with this project were a dark red. So I used rust/red primer as a "topcoat" on the doors. That meant I had an extra coat of paint on the doors, which ordinarily I would try to avoid. But it wasn't enough to obscure the detail. The photo to the right shows the doors after the bottom sprue has been carved off and the doors have been painted what will (hopefully) be their final color. The other sprue is located where the stub won't show once it is detached. Each door has a flange around it that allows it to be "dropped" right into the finished wall once you're ready to install it, so they're relatively easy to handle and drop into place once they're ready. By the way, some folks wish the doors on these buildings would open like they do on the European kits. These tend to be people who have never had wasps nest in their buildings, or who don't light their buildings' interiors. And let's face it, how many houses do you drive by in a day that have their doors standing open? You may like your windowframes to be the same color as the walls or as the trim, or you can choose a contrasting color. Because the windows are separate from the wall pieces, it's relatively easy to try another color, pop it in, and decide whether you like that look or not. 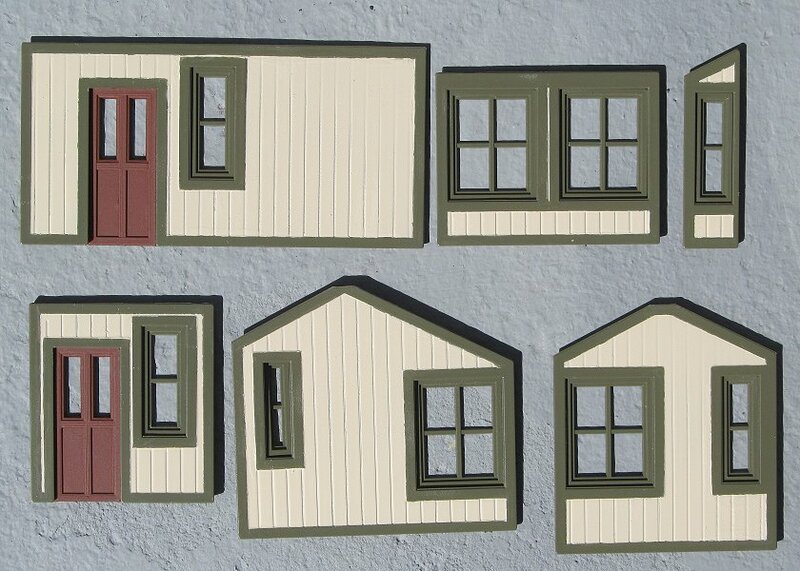 In this case, I set the windows and doors in place and decided that they looked fine the way they were. Like the doors, the windows have flanges around them that allow you to drop them into the finished wall once you're ready to install them. So they're relatively easy to handle and drop into place once they're ready. If you painted the roof the color you want it period, you're done with that. In my case, I wanted to add depth and texture to the color I chose. To make the roof a little less military-looking, I dusted it with a very light coating of the Almond that I used for the base coat. 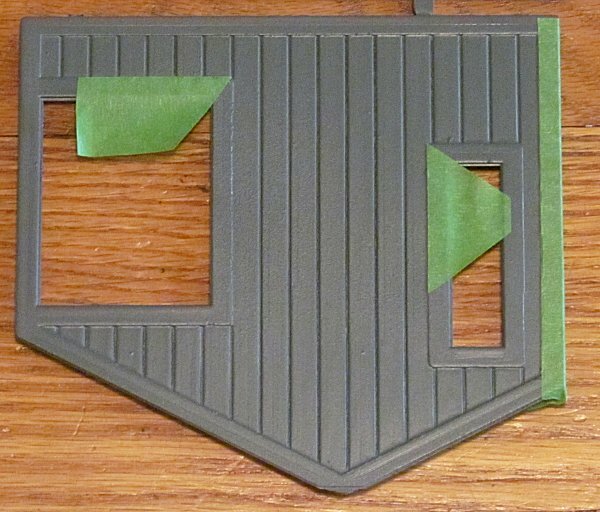 Unfortunately, that seemed to make the roof a little more neutral-looking than I'd like - almost a gray color. But I figured I'd fix that after the next step. 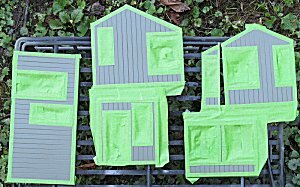 To bring out the details in the shingles, I held the pieces face down, with the "bottom edge" of the shingles facing toward the paint can. 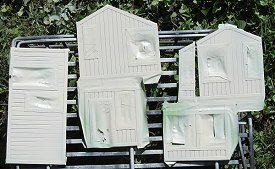 Then I sprayed underneath very lightly, so the paint would hit the bottom edge of the shingles but not settle on the surface of them - at least not much. The photo to the left shows me "underspraying" a roof piece from a different kit, because I didn't have an extra hand to photograph me doing this to the roof from this project. "Underspraying" a piece this way is more art than science. You can see that by the time I was satisfied with the amount of black color on the edges of the shingles, I had gotten parts of the roof a little dark. If this was going to be in a train yard, exposed to lots of coal smoke, it would be fine. But I was going for a more residential look. I got out the Dark Olive and undersprayed the roof one more time, this time spraying away from the lower edge of the shingles so that edge would stay mostly black. 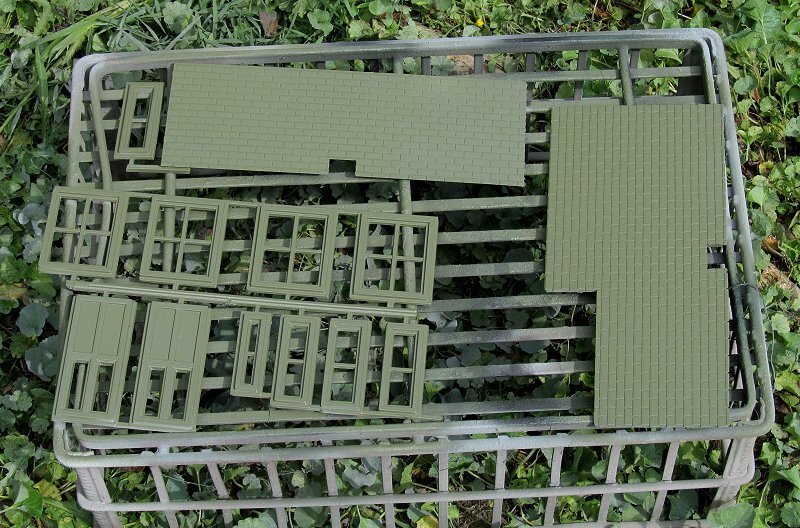 The resulting roof looks something like the Dark Olive color in photos and a few feet away, but it's not exactly the same tone, and it has a lot of dimensionality that it didn't have when I first painted it Dark Olive several steps ago. This is probably one of those things that a person interested in looking brilliant wouldn't admit to - going back again and again until I got a look that would work. But it illustrates that, even though spray paint is "permanent," color is not. As long as you don't saturate the surface so much you hide the detail, you can come back and touch it up again and again. The primer color is just a tad too dark to look right as a stone or concrete "cap" on the chimney. Flat white is one of the colors I keep onhand, so it was no hardship to wipe the chimney pieces down, then spray them very lightly so that the gray "brightened up" but not so that it turned it white. Work from a greater distance and make faster passes than you did when you were trying to get total coverage. You're not looking for complete, even coverage, just for a slightly lighter, textured appearance. Also, you won't get the exact same shade on all four sides. That's okay, once the rest of the building is painted, not one person in a million would notice. Once the chimney cap is completely dry (usually overnight), mask that and spray the rest of the chimney a traditional brick color. Again, rust/redprimer is a good choice. Multiple light coats from various directions will give you the coverage you need. 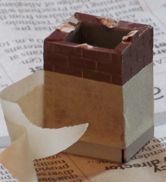 Then if you want to paint the "mortar," water down some white acrylic paint and flow it on so it goes into the cracks, then wipe if off the face of the "bricks." In the photo to the right, you can see that some of the "whitewash" stuck to the surface of the "bricks." 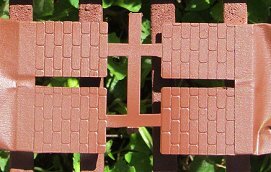 In Ohio, this will usually wear off after several months real exposure to the weather, but if you live in a desert or you want to get back to a brick color right away, wait until the "whitewash" dries thoroughly, then buff it out. 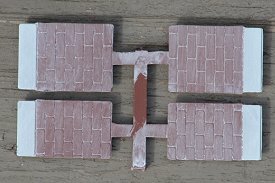 If - worst case - you wind up removing the "whitewash" from the mortar lines, what's to keep you from trying this part again? 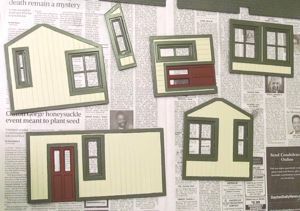 Once everything is painted and the paint has dried, it's time to glue the building together. 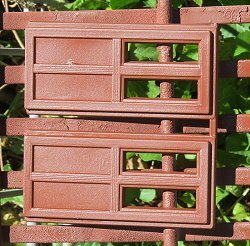 I cut the windows off the sprues and arranged them carefully to make certain I had the right windows in the right places - a couple of the skinny ones are so close in size that you could accidentally try gluing them in the wrong places. Note that some of the windows have a flange only on three sides. Make certain that the side without the flange goes toward the corner. Also, on shortest wall, it looked like the flange would protrude far enough out to interfere with the wall pieces meeting up, so I trimmed it a little before gluing it in place. In addition, if there are any rough places where the sprues came off, turn the windows so those places are away from what will be the corners of the building. If for some reason you can't, make sure any leftovers from the sprues are trimmed off. The photo to the left below shows the windows and doors glued in place from the back. The photo to the right shows them after they've dried thoroughly and been flopped over. This starting to look like a building. Click on either photo to see a blowup if you want. 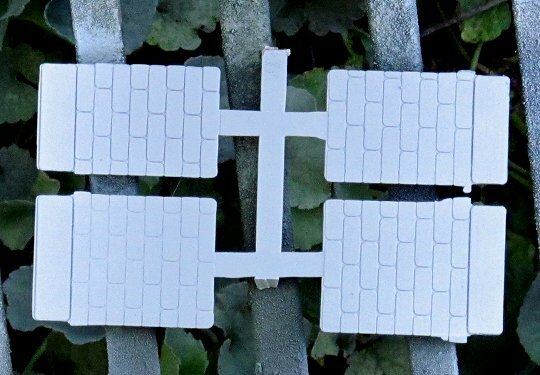 On a rectangular building, it may be possible to glue all four sides together at the same time and just use masking tape or a loose rubber band to hold them together until they dry. In an L-or T-shaped building without internal bracing, I prefer to glue two walls together at a time. 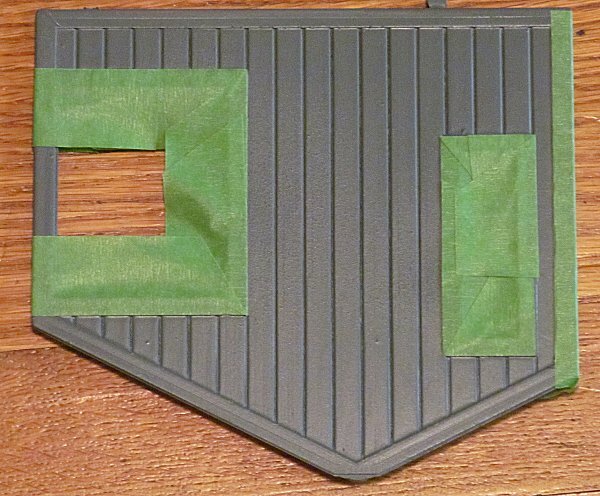 However, you do this, it's important to get the walls glued together at a 90-degree ("right") angle. Since I usually work over a newspaper, I may find an advertisement with a strong rectangular pattern to build my structure over (though I may "test" the angle with a sheet of typing paper or something to be sure it isn't distorted). In this case I had an expired Kohls ad that was printed on shiny card stock. The advantage of this was that I could turn it around on my work surface to attack the building from various angles as I was gluing it together. Recently, I've been experimenting with a noxious, but flexible glue called Fix-All that I've been getting from Big Lots for $1 or $1.50 a little tube. Fix-All takes much longer to set/dry than cyanoacrylate, but once it's dry it seems to hold better than cyanoacrylate in the long run. It's also a little bit flexible so your building's walls shouldn't just snap apart under pressure like "superglued" buildings can. The packaging says "water resistant," not "water proof," but I usually have it on the inside of buildings only, plus I make sure my buildings have good drainage. I suppose I could use it the way my friends in dry climates use silicon, to reinforce "superglued" buildings. But I structured this project so I can work a little at a time, then do the next bit a day later. Unfortunately, it will be three or more years before I am absolutely certain that this glue is up for "long term" outdoor plastic building applications. And if you're in a hurry, you can probably put this building together in one evening with cyanoacylate (and reinforce the joints with something else later). So your mileage will vary. 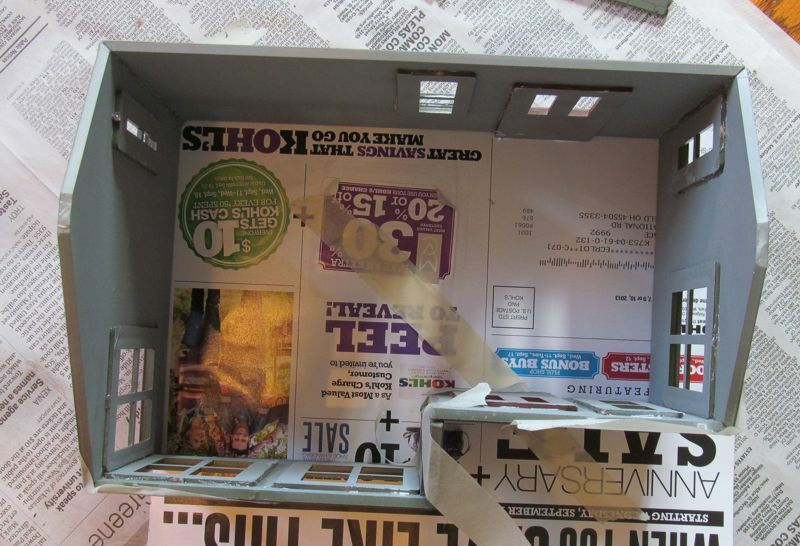 In this case, I carefully aligned the right end wall and back wall over two sides of the Kohls ad, glued them together, and used masking tape to hold them in place until the glue dried. Then I rotated the Kohls ad and did the same with the left end wall and the short front wall that needed to attach to it. Finally I added the little short wall. Then I waited overnight before joining the whole thing together. Again, if you're using the "superglue" shortcut, you could probaby come back in twenty or thirty minutes. But this way I was certain that the outer corners of the building were at precise right angles. For one thing, if your building isn't precisely square, the roof won't fit on right. This is true of any kit, by the way. The next morning, I detached the back and right side wall subassembly from the Kohls ad and moved it to where I could attach the right front wall on a right angle. 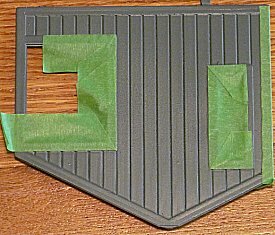 That night, I detached everything from the Kohls ad, and moved it again to be sure that the yet-unglued left rear corner was at a right angle. Then I glued the last two corners together and masking-taped everything into place. Again, if I'd been using superglue, I could probably have done this effort in one evening. But I have plenty of other projects to work on, so leaving the thing to set overnight again and again was no hardship. 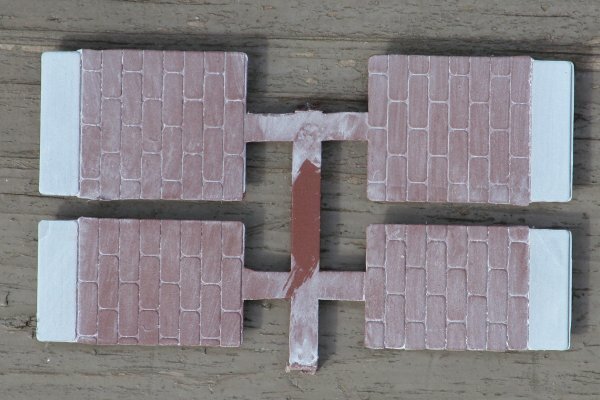 Notice that there are now six joints that are connected only by glue along the corners. Engineering-wise, this is a relatively unstable structure. The roof will add stability to this structure eventually, but in the meantime, avoid putting diagonal pressure on the corners, which could cause the building to flex out of square. 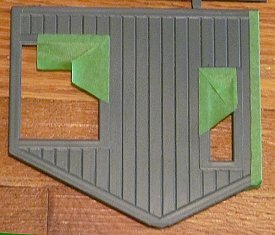 It occurred to me (fortunately) to check the fit of the chimney into the roof pieces before I glued them on, so I also glued the chimney together at this time, using masking tape to hold the pieces together tightly until they set. As it turned out it was a good thing I did. The chimney is about 1/8" too fat to go into the slots on the roof pieces. So I took a hacksaw and widened the slots on the roof pieces before I glued them on. I didn't get a photo of me sawing the chimney holes in the roof pieces larger - sorry - but I needed both hands to do the work. Now I put the roof pieces on top of the building with the chimney stuck down into the slot to make certain I wouldn't have to do more filing or something once the roof was in place. 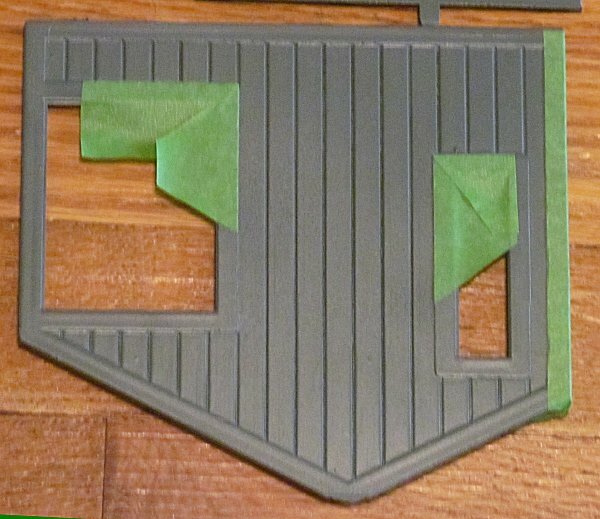 On most kits with gables, you can use the tip of the gables to help align the roof pieces. But the gables in this kit don't have tips molded in. 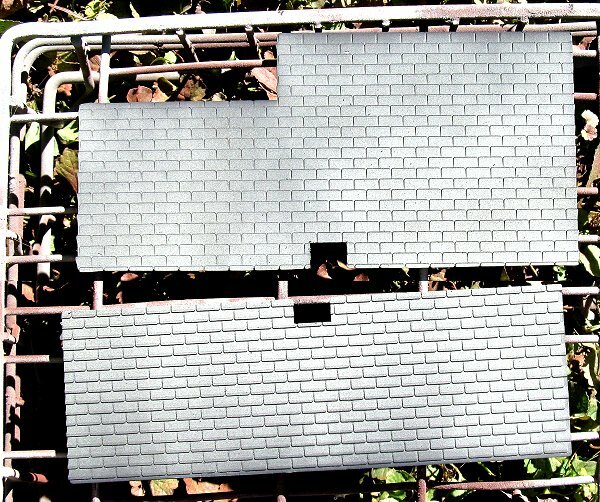 So I arranged the roof as best as I could, making sure that the little row of "half-shingles" on one piece covered the edge of the other piece where they met to provide a finished appearance. At first I just glued the roof pieces to the gables and let that dry. Aftward, I pulled the chimney out, lay the building upside down, and ran beads of glue where the roof pieces met each other and where the front piece of the roof met the edge of the front walls. Once all of these joints had dried overnight, the building felt much more solid. 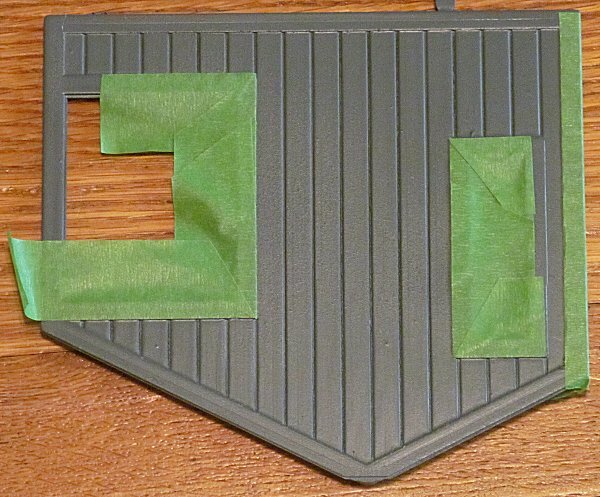 Once the roof is solidly in place, put a very thin layer of glue around the inside of the little slot where it will go in the roof, slide it into place and use masking tape to make sure it will stay where you want it until it dries. I added a bead of glue from below, too. 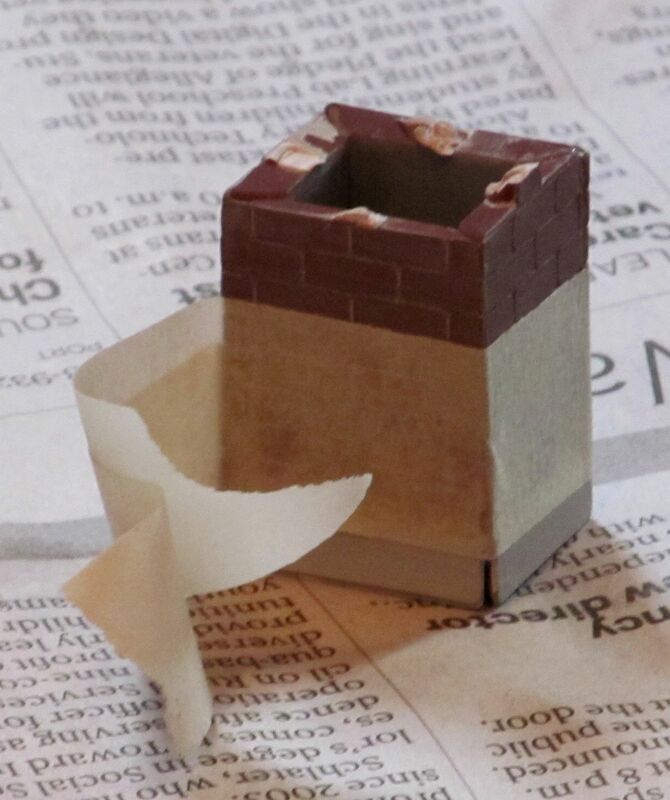 By the way, the chimney may seem to stay in place fine without glue. Don't be tempted to leave it unglued or lightly glued. At some point in the future of this building, somebody in a hurry (maybe you) will use the chimney as a handle to pick the thing up, and you don't want the building breaking away and landing on a hard surface or in the pond. Putting glazing in your building's windows makes them look more realistic; it also keeps wasps from setting up housekeeping. 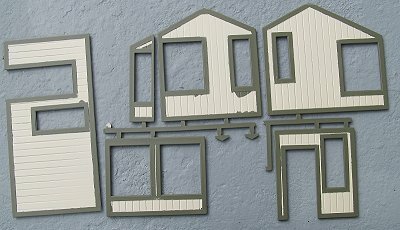 On most buildings I glaze the windows before I put the thing together. But on this one, some of the windows were so close to the corners, I wanted to make certain that my glazing didn't interfere with the building going together. If you're new to this whole process, consider using the glazing that CMS supplies as an optional add-on when you order your kits. It's very stable and easy to use. I prefer using 1/8" clear Lucite (Plexiglass) - it is very durable and adds strength to the structure itself. One reader uses clear PETE packaging to glaze her windows - the stuff that prewashed salads and deli trays come in for example. I've used that for other things but not for glazing. Because I needed to get this project "done" and get some other things done before our next open railroad, I "cheated" and tried this method, cutting up the clear plastic top of a package that a fancy pastry came in, and using only light dabs of glue to hold the plastic bits in place (in case they don't work out). Unlike the Lucite(r) I usually use and most PETE packages, this piece had a very slight rippling. 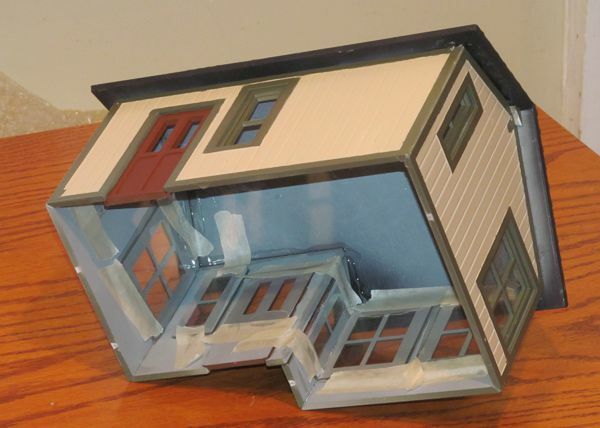 But I'm modeling an older home, on which the window glass has begun to settle, so the look is appropriate. I'll let you know how well it holds up to Ohio weather. If you want to to use the most reliable glazing, refer to our article on using Lucite to glaze your buildings. Remember how the masking tape pulled off a bit of the "base coat" earlier? Well, that happened again when I was gluing the roof and gable tips on. This time it was just little bitty places here and there. So I got out the paint cans and touched up those places again - it only took a few minutes this time. Once the "hard parts" of any building assembly are done, I'm always tempted to find a place for the building, set it out, and let it go. In fact, the photo to the right shows just that, since I have other projects to get done. But you can add additional charm with a few simple considerations. Interiors or Curtains - Depending on how you want to use this building, you may want to add an interior (for a store) or curtains (for a house). We have several curtain and blind patterns you may find helpful in our Curtains and Shades resource. 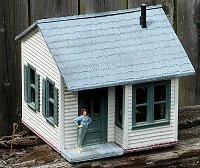 One fellow left the front windowframes out of this building and put a tiny model railroad in the windows, so the building would look like a hobby shop. Lighting - If you have curtains or interiors, consider internal lighting. I usually use 12-volt lighting, since that's what most garden lighting transformers put out. For an article on using a Malibu-style set or related technology to light your buildings, click here. For an article on using miniature 12-volt lamps that were originally designed for Christmas light strands, click here. 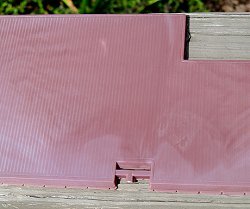 Base - In some cases, I feel it helps a building's stability to add a plexiglass base, usually painted some dull color. The advantage to this is that you can glue accessories to the base and move the whole thing when you need to. Having a permanent base also helps keep light from leaking out around the building's foundation when it's lit after dark. If you don't have time for that, consider getting one of those 2"x8"x16" landscaping blocks to set the building on. Use fine gravel or "paver base" to level the block first. Accessories Add figures, cars, signage or other accessories that help indicate what kind of building you have built. We have tips about choosing figures here. We also have lots of free downloadable signage here. By now, you should have a suprisingly effective, if inexpensive, addition to your Large Scale railroad. Several of the CMS kits go together almost exactly the same way as this one, so if you've worked through this project, you're ready for any similar CMS structure. If your next kit is from another vendor, such as Piko or Pola, you'll be able to use what you learned from this project as well. 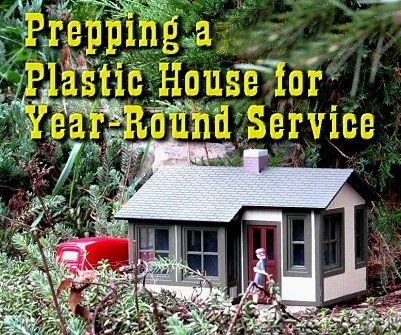 If you have a structure tip or project you'd like to tell other garden and model railroaders about, please contact me with the details, and I'll be glad to pass them on, giving you full credit, of course. * - Some kits come with molded-in color and clear plastic windows that glue in easily, so you can, technically assemble them and set them out without painting or glazing. But the "UV-resistant" plastic is only good for a few summers outdoors before the buildings fade and turn brittle and the plastic windows yellow and crystalize. If you have an indoor railroad, that's not a problem. But if you have an outdoor railroad and you hope to use your buildings on it, you will need to prime and paint them with outdoor-rated paint, and to glaze them with real glazing material like Lucite/Plexiglass (or glass). And it's a lot easier to do that before you've glued them together rather than afterwards. That's why I have written articles on Painting Plastic Structures, Glazing Windows with Lucite, and Painting a Piko Gingerbread House. ** - Korber was a "cottage industry" product that tried to fill the gap in the early days when you couldn't get US-style buildings. They were made very similarly to CMS structures, but they tended to be very small. For example, the little green and white house on this page was one of Korber's largest structures, labeled as "Centerville Station." If you come across a Korber structure, almost every tip in this article applies to them as well. To read more, or to look at recommended Outdoor or Indoor Railroading products, please click on the index pages below.